1.The joy of truth (Veritatis Gaudium) expresses the restlessness of the human heart until it encounters and dwells within God’s Light, and shares that Light with all people. For truth is not an abstract idea, but is Jesus himself, the Word of God in whom is the Life that is the Light of man (cf. Jn 1:4), the Son of God who is also the Son of Man. He alone, “in revealing the mystery of the Father and of his love, fully reveals humanity to itself and brings to light its very high calling”. When we encounter the Living One (cf. Rev 1:18) and the firstborn among many brothers (cf. Rom 8:29), our hearts experience, even now, amid the vicissitudes of history, the unfading light and joy born of our union with God and our unity with our brothers and sisters in the common home of creation. One day we will experience that endless joy in full communion with God. In Jesus’ prayer to the Father – “that they may all be one; even as you, Father, are in me, and I in you, that they also may be in us” (Jn 17:21) – we find the secret of the joy that Jesus wishes to share in its fullness (cf. Jn 15:11). It is the joy that comes from the Father through the gift of the Holy Spirit, who is the Spirit of truth and of love, freedom, justice and unity. This is the joy that the Church is impelled by Jesus to bear witness to and to proclaim in her mission, unceasingly and with ever renewed vigour. The People of God makes its pilgrim way along the paths of history, accompanying in solidarity the men and women of all peoples and cultures, in order to shed the light of the Gospel upon humanity’s journey towards the new civilization of love. 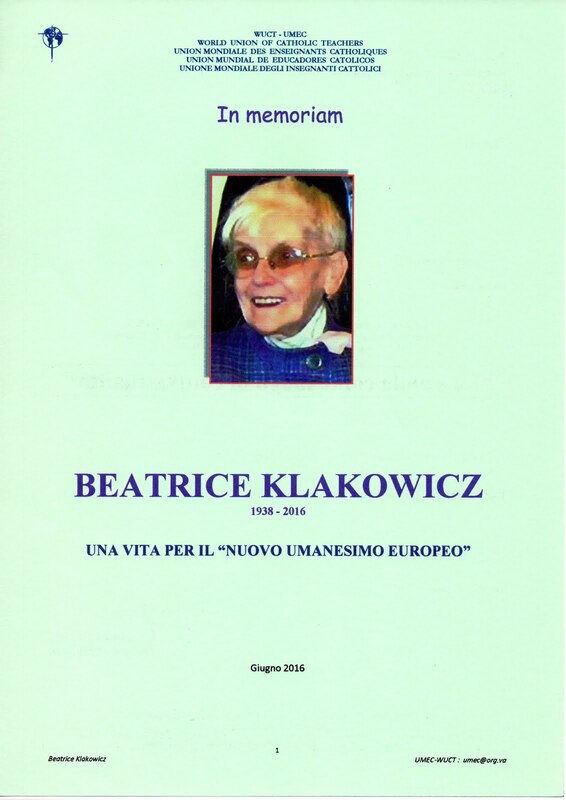 Closely linked to the Church’s evangelizing mission, which flows from her very identity as completely committed to promoting the authentic and integral growth of the human family towards its definitive fullness in God, is the vast multidisciplinary system of ecclesiastical studies. This system has developed over the centuries from the wisdom of the People of God, under the guidance of the Holy Spirit and in dialogue with, and discernment of, the signs of the times and diverse cultural expressions. It is not surprising then that the Second Vatican Council, in its decisive and prophetic effort to renew the Church’s life for a more effective mission in this moment of history, in its Decree Optatam Totius called for a faithful and creative review of ecclesiastical studies (cf. Nos. 13-22). That review, after careful study and prudent testing, led to the Apostolic Constitution Sapientia Christiana, promulgated by Saint John Paul II on 15 April 1979. The Constitution further encouraged and refined the Church’s efforts to support “Ecclesiastical Faculties and Universities, which is to say those concerned particularly with Christian revelation and questions connected therewith and which are therefore more closely connected with her mission of evangelization”, as well as with other disciplines which, “although lacking a special link with Christian revelation, can still help considerably in the work of evangelizing”. Almost forty years later, in fidelity to the spirit and directives of Vatican II and for its own timely application, the Apostolic Constitution urgently needs to be brought up to date. While remaining fully valid in its prophetic vision and its clarity of expression, the Constitution ought to include the norms and dispositions issued since its promulgation, and to take into account developments in the area of academic studies in these past decades. There is also a need to acknowledge the changed social-cultural context worldwide and to implement initiatives on the international level to which the Holy See has adhered. 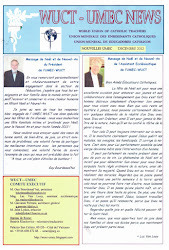 This, then, is a good occasion to promote with thoughtful and prophetic determination the renewal of ecclesiastical studies at every level, as part of the new phase of the Church’s mission, marked by witness to the joy born of encountering Jesus and proclaiming his Gospel, that I set before the whole People of God as a programme in Evangelii Gaudium. 2.The Apostolic Constitution Sapientia Christiana represented in every respect the mature fruit of the great work of reforming ecclesiastical studies initiated by the Second Vatican Council. In particular, it consolidated the progress made in this crucial area of the Church’s mission under the wise and prudent guidance of Blessed Paul VI, while at the same time heralding the contribution, in continuity with the past, which would be made by the magisterium of Saint John Paul II. As I have had occasion to note, “one of the main contributions of the Second Vatican Council was precisely seeking a way to overcome this divorce between theology and pastoral care, between faith and life. I dare say that the Council has revolutionized to some extent the status of theology – the believer’s way of doing and thinking”. It is precisely in this light that Optatum Totius strongly proposes that ecclesiastical studies “be more suitably aligned and… work harmoniously towards opening more and more the minds of the students to the mystery of Christ. For it is this mystery which affects the whole history of the human race, [and] continually influences the Church”. Dr John Lydon, Programme Director of the MA in Catholic School Leadership, recently presented at an international conference hosted by Australian Catholic University (ACU) in Melbourne. 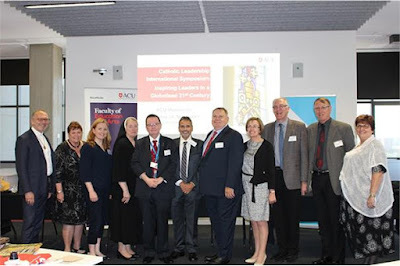 Evocatively titled Inspiring Leaders in a Globalised 21st Century, the purpose of the conference was to engage with international and national leaders and researchers to discuss and debate the nature, practice and formation of contemporary Catholic school leadership while identifying new global trends. This was to achieve the objective of developing a critical and integrated understanding of school leadership in a globalised world. The first day of the conference included keynote addresses, panel discussions and a Q & A session with international speakers drawn from the England, Scotland, Ireland, the United States and Australia. Dr Lydon was joined by fellow speakers Professor Gerald Cattaro (Fordham University, New York); Sr M. Paul McCaughey, O.P., (DePaul University, Chicago); Professor Michael Sampson (St John’s University, New York); Dr Gareth Byrne (Dublin City University); Professor Teresa O’Doherty (Mary Immaculate College, University of Limerick); Dr Roisin Coll (University of Glasgow); Dr Paul Sharkey (Director of Catholic Education Services, Melbourne); Dr Doug Ashleigh (Catholic Education Office, Brisbane) and Dr Michael Bezzina (Sydney Catholic Schools). Reflections on the first day reveal a critical need for an integrated understanding of global change and the implications for learning and leadership in Catholic contexts. The second day of the conference began with a Mass at the St Mary of the Cross Chapel on the ACU, Melbourne Campus. 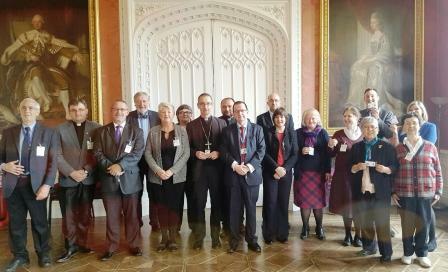 It was followed by exciting and innovative discussions concerning a proposed Global Masters in Catholic Leadership aimed at providing a unique experience for students wishing to combine study locally and internationally. Underpinning the Global Masters project is the idea that universities such as St Mary’s University and ACU are part of a global Catholic network of universities (the International Federation of Catholic Universities). 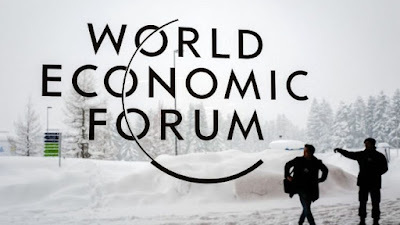 The Global Masters would be aimed at professionals who want to learn and lead as citizens of the world. 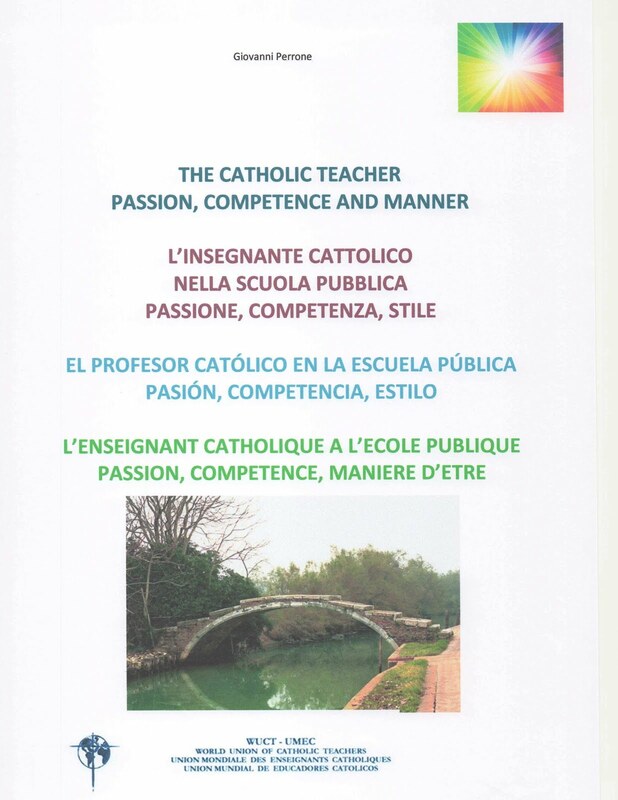 It is designed to provide leaders in Catholic education settings with the skills and knowledge necessary to succeed in the globalised 21st Century. 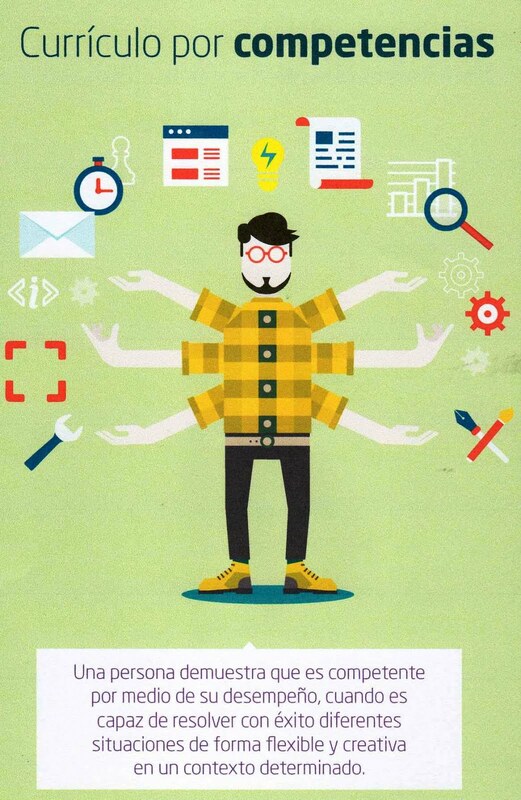 It would also provide students with an undoubtedly differentiated experience. With an international focus, a global Masters would provide students with opportunities to engage with international issues and develop a global perspective through a Catholic lens, while developing critical thinking skills from their exposure to international experience. St Mary’s would partner with ACU as it delivers a similar Masters in Catholic School Leadership. International students would not only benefit from a shared curriculum but also an enriching research environment at St Mary’s. Students would be able to be part of the Centre for Research and Development in Catholic Education (CRCDE) where Dr Lydon is Deputy Director. This centre also hosts the international Studies in Catholic Education journal of which Dr Lydon is Associate Editor and where students could potentially publish their research. 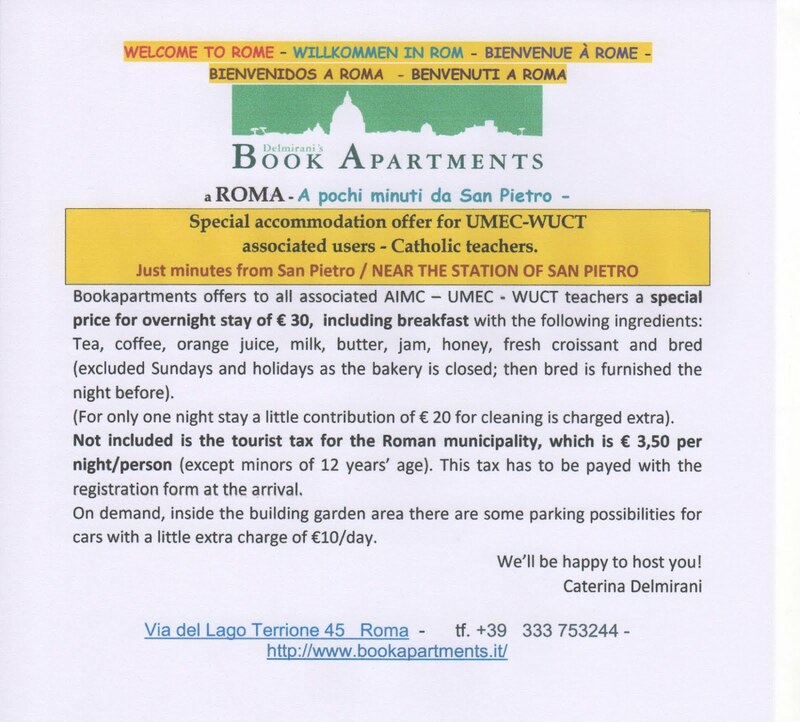 There is also the possibility of flexible options of summer schools, internships and linking in with ACU’s Rome Study Centre. All of this fits in with St Mary’s University values and strategic plan Vision 2025 which aims to increase international postgraduate student numbers, international university partnership agreements and its profile internationally as London’s Catholic University. 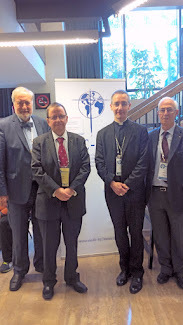 Dr Lydon said ‘participants of the conference were most appreciative of the opportunity to engage and learn more about what is happening with regard to Catholic leadership and Catholic schools internationally and identifying commonalities. Therefore, the conference was very enriching indeed from comparative research and practice perspectives’. In addition, he added that ‘committed discussions around a global masters are not only critical to meeting the needs of the Catholic education sector, but such a degree pathway would provide St Mary’s University with the flexibility and responsiveness to an increasingly competitive global postgraduate market. This degree is designed to meet the need of ethical leadership to be applied in ever complex international environments and mobile transitional communities’. Professor Br. David Hall, Dean LaSalle Academy for Faith Formation and Religious Education (ACU); Professor Geraldine Castleton, Deputy Dean, Faculty of Education and Arts (ACU); Dr Roisin Coll (Head of St Andrew’s Foundation, University of Glasgow); Sr. Mary Paul McCaughey OP, (De Paul University Chicago); Dr John Lydon (St Mary’s University London); Professor Gerald Cattaro (Fordham University, New York); Professor Michael Sampson (St John’s University, New York); Professor Teresa O’Doherty (Mary Immaculate College, University of Limerick); Dr Gareth Byrne (Dublin City University); Professor Christopher Branson (Professor of Education Leadership, ACU) and Professor Peta Goldburg, Faculty of Education and Arts (ACU).
" 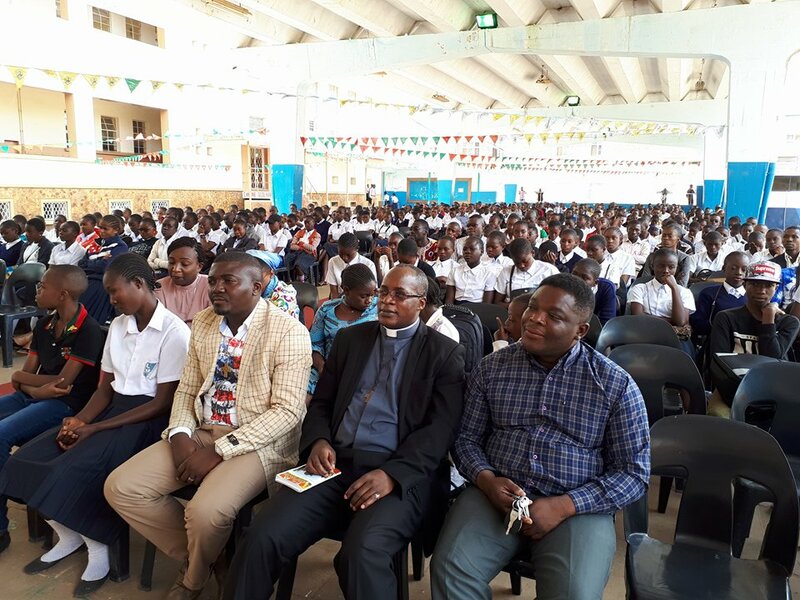 Avec les jeunes nous avons vécu la joie de célébrer la fête de Don Bosco au Collège Imara, les jeunes ont été formés sur l'Ecoute et Accompagnement en s'inspirant de l'Etrenne du Recteur Majeur Artime Fernandez "Seigneur, donne-moi de cette eau". 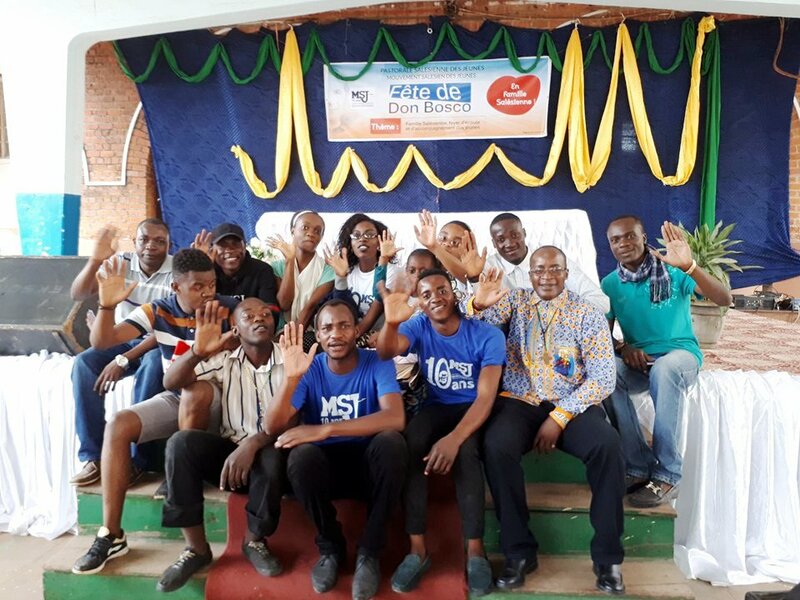 Les jeunes ont répondu à cette rencontre du Père, maître et ami des jeunes et chaque jeune a pris la résolution de se prononcer en disant: "Je suis Don Bosco aujourd'hui en RD Congo..."
Nous éduquons les jeunes à être les honnêtes citoyens et des bons chrétiens. 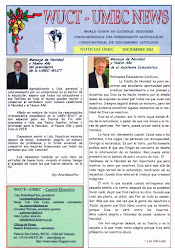 a conversation with Dr. Leonardo Franchi. That project is threatened today by forces found both within and without the Church: the fragmentation of he unity of knowledge – and of knowing as a cultural project, on the one hand; on the other, a strange twofold movement at once toward anti-intellectualism as the default cultural starting point, and toward the elevation of those with applied scientific know-how to positions of high esteem, approaching the level of a sort of priestly caste. Against this tide, a group of scholar-teachers is quietly and diligently working to ensure that Catholic institutions of higher education will be able to carry out their mission, which is of vital importance to the task of evangelization, especially and in a privileged way by being open to all human experience and ready to dialogue with and learn from every culture. 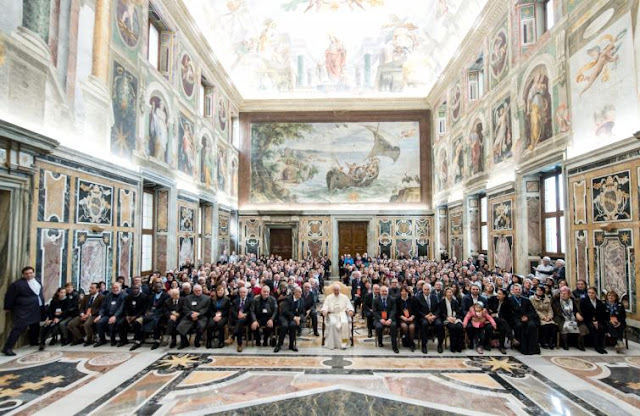 On January 5 hIs holiness Pope Francis had an audience in the Sala Clementina with around 500 participants from the National Congress Italian Catholic Primary Teachers. He addressed them on the need of ongoing professional development for teachers. He spent some time talking about the responsibilities of Catholic teachers whether they work in Catholic schools or in state schools. 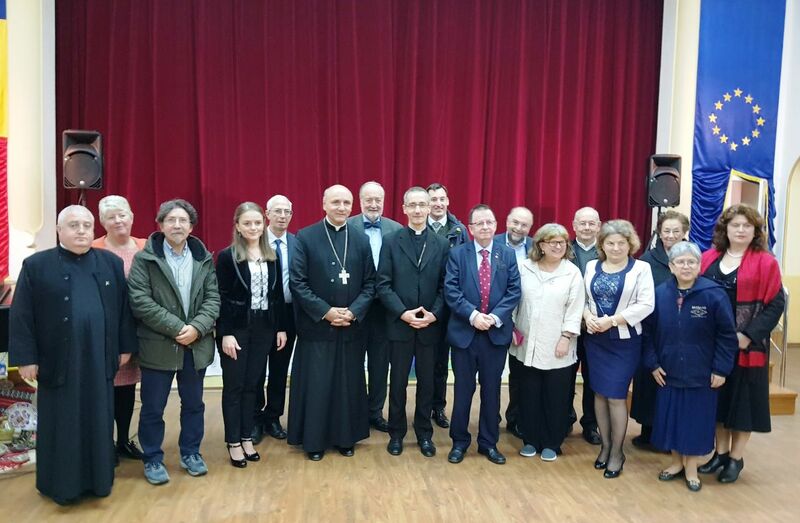 At the end of the audience His Holiness greeted personally the UMEC-WUCT delegation made up of the President, Guy Bordeaud’hui, the General Secretary, Giovanni Perrone, Father Alberto Kabuge (Congo), Father Paul Popa and the leaders of schools in Oradea. His Holiness expressed his appreciation for the work carried out by WUCT. During the work of the Congress the President of the Union greeted all present and thanked AIMC for its ongoing collaboration with WUCT. El 5 de enero, Francisco recibió en audiencia en la Sala Clementina, los cerca de 500 participantes en el Congreso Nacional de Maestros Católicos italianos, y los llamó un mensaje que pone de relieve la importancia de las asociaciones para el desarrollo profesional de los educadores. Se centró en las responsabilidades de los maestros católicos, donde sea que trabajen, tanto en la escuela católica como en la escuela estatal. Después de la audiencia, el Papa quiso saludar personalmente a todos, incluyendo a la misión dell'UMEC-WUCT compuesto por el presidente, Guy Bourdeaud'hui, Secretario General, Giovanni Perrone, por el Padre Alberto Kabuge (Congo), por el padre Paul Popa y los directores de las escuelas de Oradea. Su santidad expresó su aprecio por el trabajo llevado a cabo por la Unión. Durante las obras del congreso, el presidente de la Unión saludó a los congresistas y agradeció a la AIMC por su constante colaboración con la Unión. Op 5 januari ontving Zijne Heiligheid, paus Franciscus, in audiëntie, in de Sala Clementina, ongeveer 500 deelnemers aan het Nationale Congres van de Italiaanse Vereniging van Katholieke Leraren en gaf een boodschap over het belang van verenigingen voor de professionele groei van opvoeders. Hij concentreerde zich op de verantwoordelijkheden van katholieke leraren, waar ze ook werken, zowel op de katholieke school als op de openbare school. 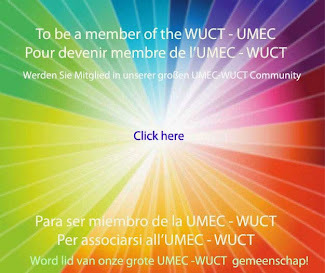 Aan het einde van audiëntie wilde de paus iedereen persoonlijk begroeten, inclusief de UMEC-WUCT-delegatie, bestaande uit de president, Guy Bourdeaud'hui, de algemene secretaris, Giovanni Perrone, pater Alberto Kabuge (Congo), pater Paul Popa en de directeuren van de scholen van Oradea. Zijn heiligheid sprak waardering uit voor het werk dat door de UMEC werd verricht. Tijdens het congres begroette de president van de UMEC de congresleden en bedankte de AIMC voor hun voortdurende samenwerking. 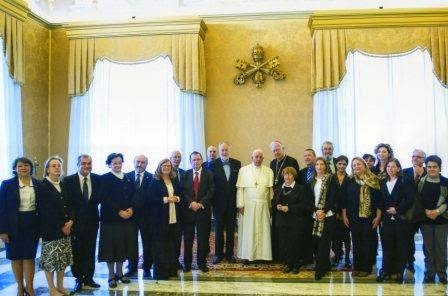 Il 5 gennaio Sua Santità Papa Francesco ha ricevuto in udienza, nella Sala Clementina, i circa 500 partecipanti al Congresso Nazionale dell’Associazione Italiana Maestri Cattolici e ha rivolto loro un messaggio che evidenzia l’importanza delle associazioni per la maturazione professionale degli educatori. Si è soffermato sulle responsabilità degli insegnanti cattolici, ovunque essi operino, sia nella scuola cattolica sia nella scuola statale. 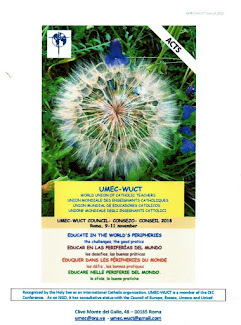 Al termine dell’udienza, il Papa ha voluto salutare personalmente tutti, compresa la delegazione dell’UMEC-WUCT, composta dal presidente, Guy Bourdeaud’hui, dal segretario generale, Giovanni Perrone, da padre Alberto Kabuge (Congo), da padre Paul Popa e dai direttori delle scuole di Oradea. Sua Santità ha espresso apprezzamento per l’opera svolta dall’Unione. Nel corso dei lavori congressuali il presidente dell’Unione, ha salutato i congressisti e ringraziato l’AIMC per la costante collaborazione con l’Unione. În 5 ianuarie, Sanctitatea Sa Papa Francisc a primit în audiență, în Sala Clementină, pe cei circa 500 de participanți la Congresul Național al Asociației Italiene a Profesorilor Catolici. 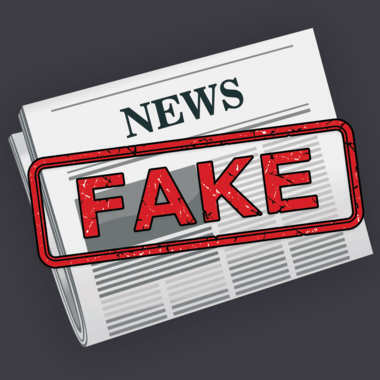 Acestora le-a adresat un mesaj care evidențiază importanța asociațiilor pentru maturizarea profesională a dascălilor. A insistat asupra responsabilității profesorilor catolici, oriunde s-ar afla aceștia, într-o școală catolică sau într-una de stat. La încheierea audienței, Sfântul Părinte a salutat personal pe toți cei prezenți, inclusiv membrii delegației Uniunii Mondiale a Profesorilor Catolici – UMEC/WUCT, compusă din președinte, domnul Guy Bourdeaud’hui, de către secretarul general, domnul Giovanni Perrone, de către pr. Albert Kabuge din Congo, pr. Paul Popa și de către directorii școlii din Oradea. Sanctitatea Sa și-a exprimat prețuirea pentru munca desfășurată de către Uniune. În timpul lucrărilor, președintele Uniunii a salutat participanții la congres și a mulțumit Asociației Italiene a Profesorilor Catolici pentru colaborarea constantă cu Uniunea.